Kamaru Usman believes he has put a finger on the reason behind Ben Askren’s popularity, and it is not because of his “funky” style of wrestling. Ben Askren has become known to mix it up with many of his peers on social media, including jestingly calling Kamaru Usman “Marty from Nebraska,” referring to Usman’s nickname of “Marty” during his high school and college wrestling days. 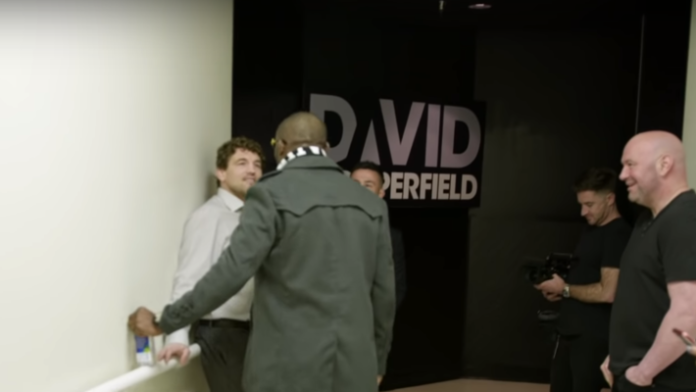 Kamaru Usman has even confronted Ben Askren backstage prior to the UFC 235 press conference before being separated by UFC officials. One thing that separates Ben Askren from the common “troll” is his professional MMA record of 19-0 and a successful debut against a former UFC champion. And if Ben Askren keeps his undefeated record in tact in his next fight or two, another thing that may separate Askren from trolls is that this “troll” could find himself face to face with the man he was trolling on the Internet in a sanctioned fight…and actually want to be there. Do you agree with Kamaru Usman? Is Ben Askren’s appeal to fans because he is a troll?